Today I have been on Nutrisystem for 1 month and have lost a total of 8.7 pounds. 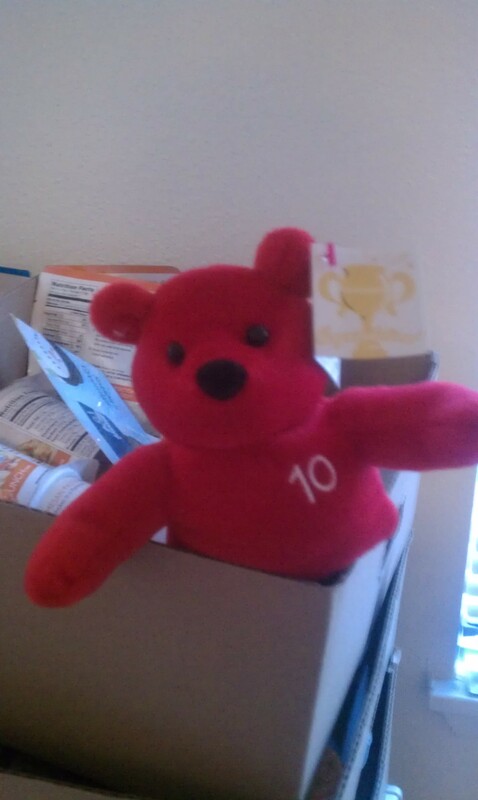 I am so close to my first nutribear, the red pound bear that signifies I have lost 10 pounds. I am so close that I can just taste it but it seems as soon as I get within 1/2 pound of that milestone my body fights it. Pound is chilling in my food box until I can take her out. I have not been exercising this entire time while on NS, so my goal for May is to start exercising. I purchased a bike a couple days ago and will be biking the trails near my house. I also will be using my Journey Gym since our 90 day challenge started last week and will return to Revolt Fitness exercises that my husband is reviewing. I really don’t know how to start this post. This last month hasn’t been a good one. I had to make a difficult decision in my work and career. To be honest it wasn’t a good week for me either. I gave up a super stressful job with decent pay and great benefits without any backup plan because it was causing my health to decline . I have no job lined up and haven’t applied to anything because my last month of work kept me extremely busy. To top all that off, I won’t be eligible for unemployment because I voluntarily quit. This last week at work was one of my most stressful in my life but I am free now and have the month of May to make up for all the stress eating I have been doing. Sometimes in our adult life we have to make sacrifices for the betterment of ourselves and career and me leaving that job was a sacrifice but it is also a growing experience for me. What new opportunities await me is unclear at this point but I know with my education and experience that something better will come along. I just have to have faith that it will get better because it certainly can’t get any worse. I really believe that I will be able to ficus more on me now that I stood up for myself and left the company. That said, I must have done something right because I walked away this week 1.9 pounds lost! I have no idea how that can be. I am not one of those lucky people that don’t eat when they are stressed so I was shocked when the scale showed 1.9 pounds lost. In fact, I checked the scale 2 times just to make sure! I’ll take it! All I can really say about it is it shows that Nutrisystem really works. How someone can stress eat all week and come out 1.9 pounds lost in one week is beyond me but NS works people! PS: Want to lose weight and get healthy on Nutrisystem? Join today by calling (1-888-853-4689) or by visiting Nutrisystem Online. You are doing fantastic Emily. Keep up the good work. Stress can be hard when trying to lose weight but stay focused and you will get there. Baby steps! Those are great results, I love that their system has helped so many people. Keep up the great work can not wait to see pictures of the bear.